Long ago in a time far far in the past (1966) a man named Gene Roddenbery was touched by God. Well, maybe not exactly touched by God but touched by some kind of super powerful, all-knowing muse who knocked on the door of his imagination and in flew a star ship named The Enterprise. The Enterprise brought along Captain Kurt, Mr. Spock and the rest of his brave crew to give us the show that would change T.V. forever — Star Trek. Many of us can still hear the siren song of the opening music. Can you hear it? The sounds instantly fill us with a sense of daring and hope. We are all for “going where no man has gone before” and most of us will never out grow the desire! In the 60s and 70s we didn’t know how important this wildly creative show would be. We couldn’t imagine the multiple spin offs, resultant technological advances, the theme park in Las Vegas from 1998 to 2008, but we did get its progressive civil rights stance. We’re thankful the censors of the time left the bulk of this groundbreaking story alone. After all, it wasn’t common to portray main characters as anything other than white males. Star Trek gave us not only a woman in a central role but a non-Caucasian woman! The diversity allows us to think of ourselves in space with the crew and their incredible weapons, doing heroic deeds against creatures that crawled straight out from under our beds! Star Trek stays popular and relevant because it is fun and original AND because it includes everyone. We can all imagine ourselves being with the crew of The Enterprise. Thus Trekkies were born. Bookmans Speedway is a great place for Trekkies regardless of whether your favorite series is the original Star Trek, Next Generation, Deep Space Nine or Voyager. We have action figures in a variety of sizes including Lt. Commander Deanna Troi, Lt. Commander Worf, Captain Benjamin Sisko and Klingon Ambassador to the Federation, K’Ehleyer. We also have some unusual action figures such as Lt. Commander Data that includes a Type II hand phaser, diagnostic testing unit with monitor, tricorder with holster and android access panels. We have a Warp Collection Spock fully articulated and pose-able with bonus Silver Star Fleet emblem. 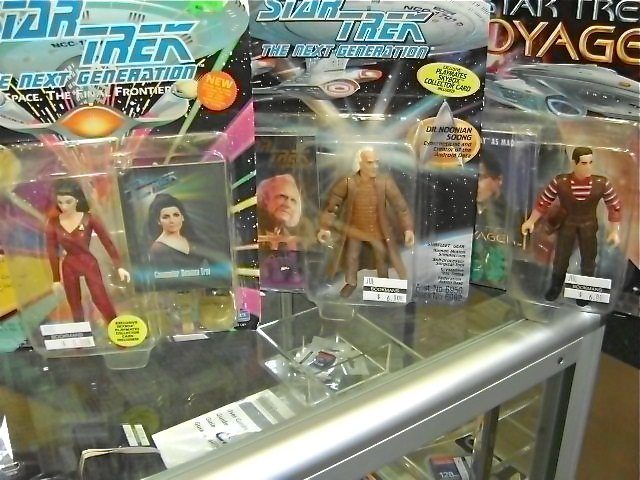 Little Trekkies can have fun too with Star Trek Fighter Pods series 01 or Next Generation 25 Pez Collectable series. Seasoned fans can get the grand prize of collectables with our USS Reliant NCC-1864 1:537 scale plastic assembly model kit or the Star Trek Next Generation Romulan Warbird. This highly detailed replica of the Romulan Warbird is the ultimate attack cruiser. If you are a Trekkie, we have the finds you crave, have Scottie beam you over to Bookmans Speedway today! * Bookmans can not guarantee stock. If you are interested in a specific item mentioned in this article, give Bookmans Speedway a ring at 520.748.9555. Bookmans is the place to browse, but it’s a good idea to make sure the title is still on our shelves before you come in.